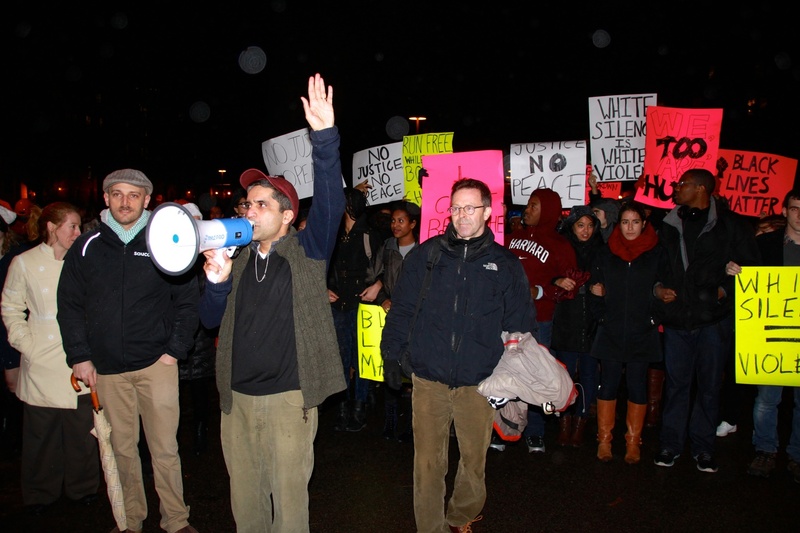 Dean of College Rakesh Khurana speaks on behalf of protesters during Primal Scream early Thursday in Harvard Yard. Dean of Student Life Stephen Lassonde stands at his side. A group of about 30 students attempted to hold a silent demonstration in the first minutes of Primal Scream, a biannual naked run around Harvard Yard, early Thursday morning, inadvertently leading to a chaotic exchange of words and gestures that reversed the usual direction of the run and left many questioning the significance of the heated interaction. The run is a College tradition in which students, at times inebriated, run naked around the Yard on the eve of the first day of exams. It usually attracts more than a hundred participants. Protesters said that their goal was not to protest Primal Scream itself, but to hold a four-and-a-half minute period of silence before the run for Michael Brown of Ferguson, Mo. and Eric Garner of New York—two unarmed black men who were killed by white police officers this summer—and to join in solidarity for people around the nation who have experienced racism. The organizers of the demonstration had posted a Facebook event describing their plans for the protest ahead of the event. While protesters said they felt ignored and angered by the actions of Primal Scream participants, several students in the run said they could not see nor hear the protesters because of the noise and nature of the gathering, with some saying they would have participated in the protest if they had known about it in advance. About 25 College administrators, including Dean of the College Rakesh Khurana and Dean of Freshmen Thomas A. Dingman ’67, were present in the surrounding area before the run began, and a few stood near the protesters to ensure that both the moment of silence and the run could take place safely, according to Dingman. Dingman said he had met with the Harvard Band in advance and asked that they not play during the moment of silence. As student streakers began to gather, talking and shouting, just a few yards away, the protesters, some of them clad in black sweatshirts with the words, “I ♥ Black People,” stayed silent. After failing to quiet the students with a megaphone, Khurana was lifted onto the back of a half-naked man, from where Khurana tried to quiet the crowd again. Dean of College Rakesh Khurana attempts to gain the attention of the participants of Primal Scream by climbing onto the shoulders of a Primal Scream runner in December in Harvard Yard. Other students organized a protest, in response to recent grand jury non-indictments, that attempted to delay the start of the run. When the streakers continued to talk, the protesters broke their silence, chanting, “Silence. Silence.” Meanwhile, shouts of “U.S.A., U.S.A.!” erupted from the group of runners, drowning out the calls for silence by the protesters. Primal Scream participants have also chanted “U.S.A., U.S.A.!” during past runs. Shortly after, a group of streakers from the back of the crowd began to run in the opposite direction of the protesters, and the rest of the streakers followed in a lap around the Yard. The protesters turned to face the streakers after they finished their first lap around the Yard, forcing some streakers to run off the path and into the middle of the Yard. Some runners chanted, “black lives matter!” while others shouted obscenities. After the runners dispersed, the protesters walked to Lamont Library, shouting slogans common to the widespread protests of recent weeks, such as “No justice, no peace.” After walking up several floors in the library while chanting, the protesters reassembled in the Lamont lobby, as Khurana looked on. Primal Scream runners and Black Lives Matter protesters face each other before the start of Primal Scream Thursday morning in Harvard Yard. During Primal Scream, students organized a Black Lives Matter protest in response to recent examples of police brutality. Addressing the crowd, Walker and Sarah F. Cole ’16, another protester and president of the Black Students Association, expressed frustration that the silent demonstration did not go as planned. A small battle over the nature of the public library is raging in the imaginary cyber-war that grips our country.